Upcoming horror board game Monster Slaughter taps into the best thing about watching campy horror movies: the order in which teens die. Where it one-ups popcorn and The Blair Witch Project is that, in Monster Slaughter, the player is the beast killing off the obnoxious teens. In Monster Slaughter, players operate a family of monsters—zombies, werewolves, vampires or golems—who kick down the doors of a log cabin to brutally kill a group of teenage stereotypes. Each player designates the humans’ ideal death order before playing. If they pull it off, they earn extra points. To strategize, players can peek through doors to search for their targets and even toss humans weapons to defend themselves, delaying their death to meet their planned murder schedule. After each round, the moon token is moved, designating the night’s passing. “Meat,” “Blood,” “Brains” and “Bones” tokens each confer points, and the player with the most points win. Gory art and cartoonishly horrible miniatures help enhance the game’s upbeat creepiness. Monster Slaughter does a lot with straightforward mechanics. Most things are decided by dice rolls, and on each die, the only two options are success and failure. Doing something just means rolling enough successes to beat a designated number. “Searching” for humans has players looking through each cabin room’s associated deck, where they might find traps, explosions, handy weapons or their targets. Each monster family has their own bonuses. In essence, the game is about squeezing the most points out of the best victims at the right moment, a devilish and fun twist on the “get good loot, kill the bad guys” formula. The mechanics feel clean, comprehensible and easy to modulate around your preferred play strategy. In the 45 or so minutes I played at Gen Con, I found there were a lot of ways to win, which leads me to believe that several playthroughs will add some gratifying depth to the game. 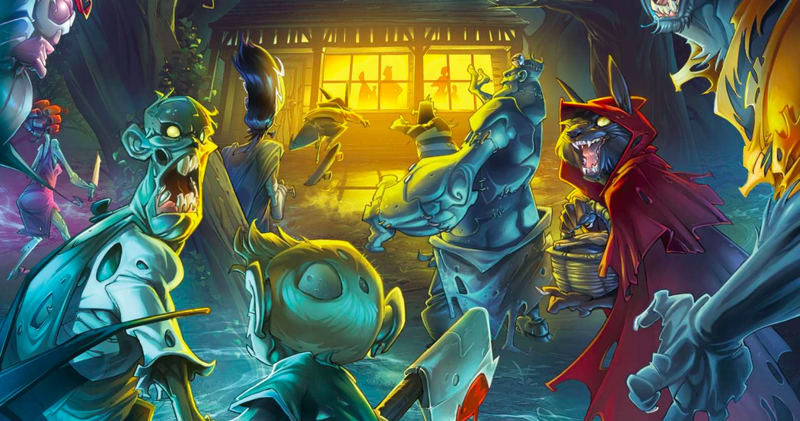 Monster Slaughter will arrive on Kickstarter this Halloween, and in its current state, it feels like a likely hit for fans of ‘80s horror classics and easy-to-pick-up (but deep) strategy games. [Update:—10/31/17]: Monster Slaughter just launched its Kickstarter.